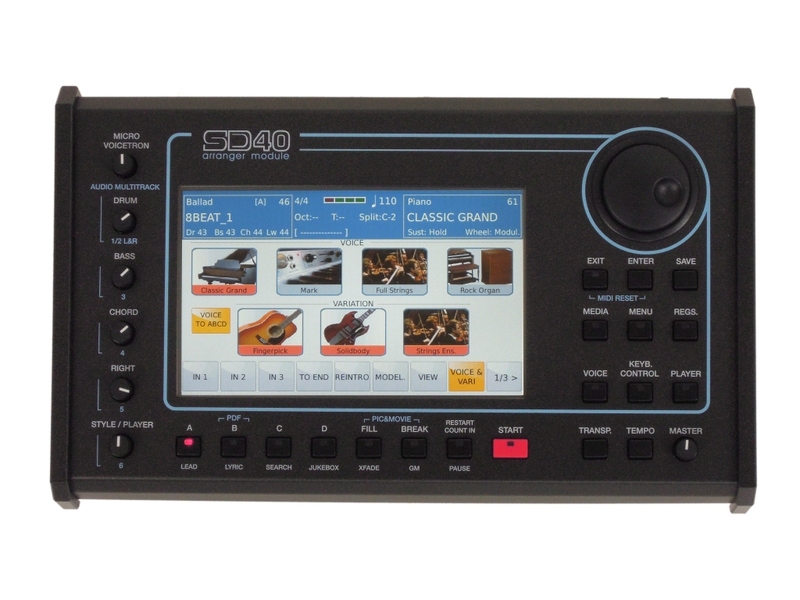 STYLES The SD40 has an innovative, professional arranger section with 260 styles with an impressive library of more than 300 Latin Percussion Grooves and 200 Audio drums perfectly synchronized with the internal clock. The arranger is made up of 4 sections ABCD with 4 Fills, 4 Breaks, 3 Intros, 3 Ending, To End and other functions such as Reintro, Key Start_Key Stop, Restart, Pause, Count In and 5 User tabs for custom personalized functions. The accompaniment provides Audio Drum, Bass, 5 Chords and 3 orchestral VARIATIONS. 4 lead voices can automatically be assigned to the right (lead voice) and it is possible to match them to the ABCD parts of each style. The forthcoming arranger system of the SD40 is very open and allows you to quickly modify the voices, volumes and effects of each style on fly, and to then save the changes as a USER STYLE without affecting the factory library. With MY LIST, the user can further consolidate and store 64 favourite styles in one location making it easy to instantly search for. The Style MODELING is a powerful tool available on the SD40 which allows the quick selection of hundreds of Audio Drums, Grooves, Bass lines, Piano, Guitar and Orchestral tracks accessed via the internal Modeling library. Creating a new custom arrangement simply by using Style Modeling is a really exciting experience. You can easily find assortments and combinations between different musical genres by interchanging sounds and patterns with a perfect rhythmic synchronization all the time. PLAY MODES The SD40 has been designed to be configured for use in different ways. If you are a pianist, you can use the PIANIST mode to play with a normal piano technique while controlling the arranger. If you prefer to play the Manual bass then the BASSIST mode is available which permit you to control harmonies performed with both hands in real time. A new dedicated menu has been developed for the ACCORDION with two modes: CLASSIC: the accordionist can program complete manual orchestrations with 2 voices allocated to the left/chord and 3 voices to the right. This set up can be stored in a Registration for instant recall on stage. STYLE: this mode utilizes the Arranger controlled by the Left Hand. 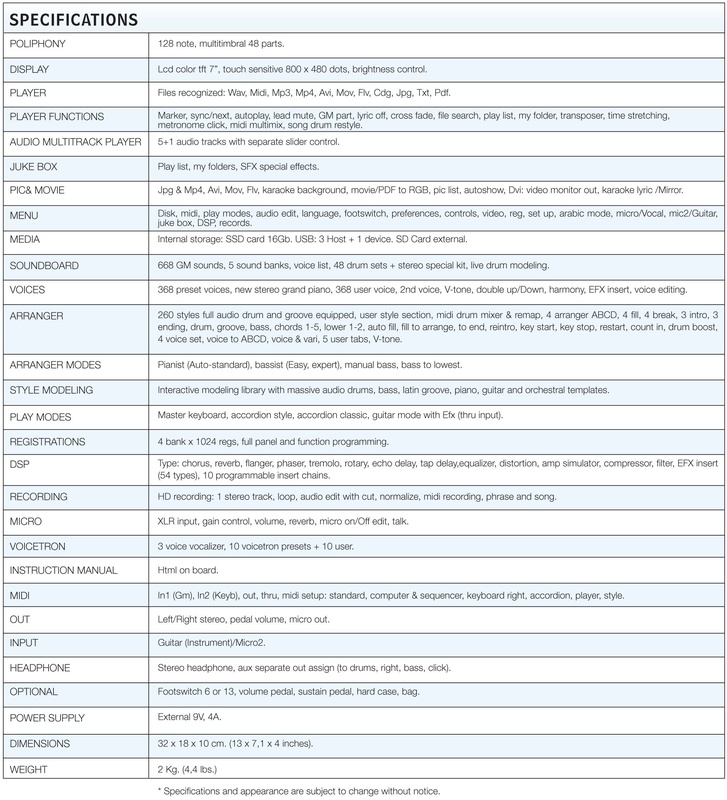 With a new Bass To Chord function, the accordionist can also define chords which are normally not available in the normal accordion technique such as Minor 7th, Sevent Augmented, 4th and others, especially useful for light music and jazz. SOUNDS The SD40 Sound generation offers a big variety of Orchestral sounds with a Stereo Grand Piano, new Brass and Sax sections, new Guitars and Basses all multi- layered plus new Pads, Strings, Accordions, Synth, Electric Pianos and Special Effects. There’s also a rich selection of tone wheel Organ sounds with a true reproduction of the classic slow-fast rotary speaker effect. 49 DRUM KITS and more than 300 LATIN percussion GROOVES are also available. 368 Preset Voices divided on 12 families with an accurate Editing menu, 2nd Voice, 3 sound layering and User Voice capability. On the VOICE LIST section you can store your favourite 32 Voices. REGISTRATIONS Registrations allows you to take a snap-shot and store the general panel settings and current conditions of the SD40. 4 storage Banks each capable of holding 1024 Registrations are available. These Registrations are easily controlled on the touch screen and can be quickly recalled using the numeric keypad or externally via MIDI. 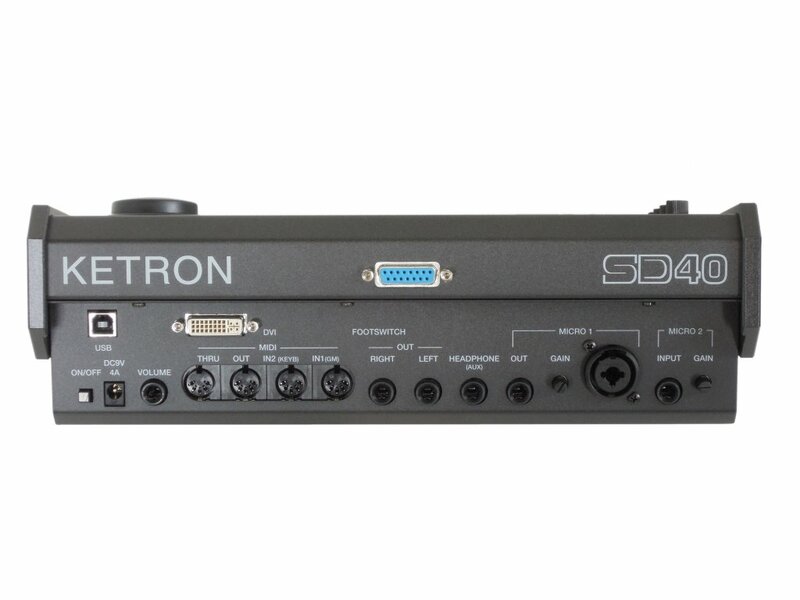 With the use of a dedicated App, it is also possible to manage the Registration settings of the SD40 to control external data base of songs, texts, etc. 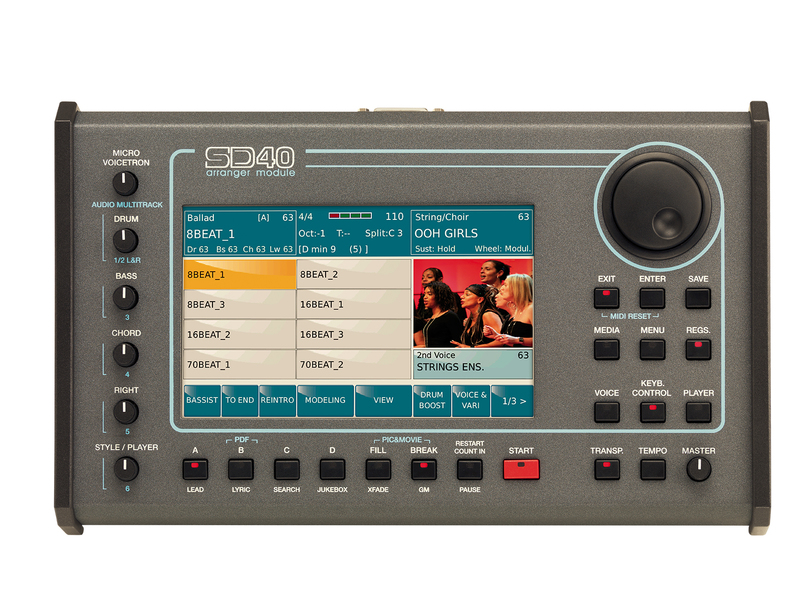 PLAYER SD40 is equipped with a professional Player capable of playing back MP3, MIDI (different formats with lyrics), WAV, FLV, CDG, MP4, AVI, M4A, JPG, TXT with functions like Cross Fade, Lead Mute and Search both Alphabetical or Numerical. Modern display of LYRICS, TEXT and KARAOKE with the ability to visualize on the display or on external monitor ( DVI ) movies, video clip or graphic files on PDF format such as music scores. You can create custom PLAYLISTS and also have the ability to quickly access your favourite files thanks to MY FOLDER. The JUKE BOX ambient is also provided for a faster access to the songs and a new RESTYLE function which allows you to replace the drum track of a MIDI file with any of the internal Audio Drums available. Another important feature of SD40’s player is the AUDIO MULTITRACK that allows the playback of multiple wave files extracted from an audio project. The volume of the 6 tracks may be controlled individually with the potentiometers on the panel and a Click metronome can be send out through the headphone output as well (Aux). RECORDING The SD40 has an Audio and MIDI recording menu. It is possible to memorize brief patterns to be looped in PHRASE mode (also using the Arranger) or record complete sequences in SONG mode. The audio track is recorded as a stereo WAV with level and sample’s start-end edit capability. DSP/MICRO/INPUT The DSP section offers Chorus, Reverb, Phaser, Tremolo, Flanger, Rotor, Echo Delay, Tap Delay, Overdrive, Distortion, Amp simulator, Compressor, parametric 4 band EQ and also two EFX insert with 54 different types of effects and 10 programmable Insert chains. 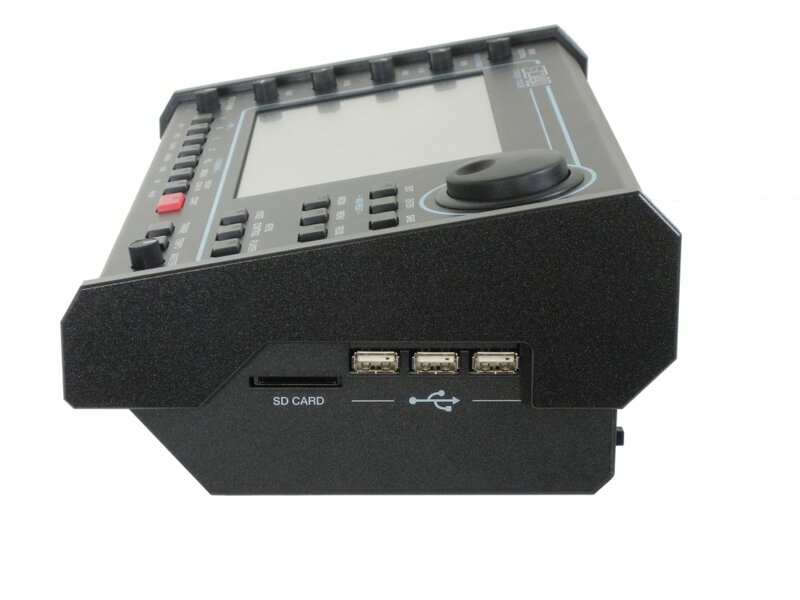 The SD40 has a symmetrical Microphone input (XLR) and a 3 voice Vocalizer section which may be assigned to Arranger, the Lead voice or Midi file. The lnput can be used as a secondary Microphone or as Guitar input. The Guitar can be processed with all the internal DSP effects with the ability to control them via Footswitch (KETRON FS 13 or FS 6). With a Midi guitar you can also drive Arranger by simply playing chords on the instrument. MULTIMEDIA/USER INTERFACE The multimedia set up of SD40 includes 3 USB Host, 1 USB device to manage the instrument directly from your computer and an SD Card connection. The instrument’s touch screen interface is very intuitive and navigating between different menus is easy even without the help of the operating Manual (that resides inside the module as an Html multilingual file). A Brightness control allows you adjust the luminousity of the display, especially useful in dark conditions.